Who doesn't like swimming in the warm summer days? It really feels the best thing to do on days when temperature only seems to go up. However, you need to keep calm and know a thing or two before you go swimming with contacts. It is not always a great idea to swim with your contacts. Why is that? Let's find out now. So many bacteria and microorganisms live in the water, including the water found in lakes, oceans, streams, hot tubs, swimming pools, and even tap water. Your body's defense system activates itself whenever you are exposed to these disease-causing microbes. That is the reason why you do not experience any ill effects of your exposure to these microorganisms. Unfortunately, wearing contact lenses is like creating breach in your body's defense system. Contact lenses are quite like very small sponges and they can absorb anything including the water along with the microorganisms in it. When the water gets trapped into the lens, the microbes in it start attacking the surface of the eye. Under normal conditions, your eyes keep them protected by removing any of these microbes by blinking, and your tear ducts help flush the unwanted particles and even microbes out of your eye. Unfortunately, with contacts, these microbes can hide underneath the surface of your contacts and stay there even when you blink a lot. You may develop a sight threatening eye infection when a bug called Acanthamoeba sticks to the surface of your contact lenses. It is most commonly found in ponds, lakes, and rivers, but even treated and filtered tap water may have it. Swimming pools are treated with several chemicals that can cause irritation to the eyes and later lead to an infection. The infection caused by the bug called Acanthamoeba is called Acanthamoeba keratitis that can result in rapid scarring of the cornea. It is difficult to treat, so you may end up affecting your vision. 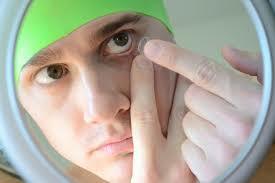 You may also develop a number of other issues after swimming with contacts. You may find it extremely uncomfortable to wear your lenses when they swell because of water. Your eyes may feel drier in case water washes away the normal tear film. The conjunctival tissue of the eye may swell and become red because of the chemicals found in hot tubs and swimming pools. Saltwater pools can also be irritating to the eyes. There is always a risk of losing your contacts while showering or swimming. What If I Wear Goggles? You can lower your risk of developing common complications by wearing waterproof swim goggles while swimming with contacts. These goggles not only protect your eyes from contaminants but also lower the risk of you losing your contact lenses while swimming. Moreover, prescription swimming goggles are also available today that work just like wearing eyeglasses and let you see clearly while swimming. Do not over-wear your lenses. You should not wear your lenses all the time, but take them out for some time to give your eyes rest. Those contacts limit the amount of oxygen your eyeballs get and this over time can result in the corneal swelling, which often leads to corneal abrasion. Never sleep with your contacts on. It is important that you take your contacts out before going to bed. Not doing this would result in serious irritation to the eyes. Your eyes may also swell, and if an infection occurs during this time, you may end up losing your eyesight. Take your lenses out when your eyes are irritated. Remove your lenses immediately when you feel your eyes become red and irritated. There could be an infection or your lenses may well be contaminated. Be sure to disinfect your contacts before you wear them again. .
Do not rub your eyes. Last thing you want when your eyes are already irritated is rub them with your contacts on. Excessive rubbing can lead to a condition called keratoconus in which your cornea turns into a round-like shape. This develops blurred vision and even requires a corneal transplant. Try OTC drops to reduce itching instead of rubbing your eyes. Stop wearing your lenses if they suddenly become uncomfortable. 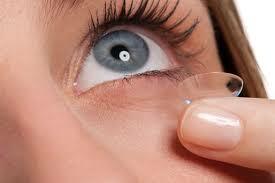 Never wear your contacts when you notice a tear or chip in them. Never handle your lenses roughly and ensure they do not get into contact with your fingernails. Do not move around if you lose a lens; instead, check your clothes, lashes, and immediate areas around you. Never pick up your dropped lens with your fingernails – simply dampen your finger first and the lens will stick to it. Only use the solution your doctor has prescribed for your lenses. Never wear a soft lens that may have been out of solution and feels brittle. Never try to put the lenses in your mouth to make them wet. Use nothing but saline or disinfection solutions to rinse your lenses. Soak a soft lens with disinfecting solution if it is folded over onto itself. Never rub your lenses with tissue, towel, or shirttail. Stop wearing your lenses when you have a cold or the flu. Use eye protection when riding in open cars while wearing your contacts. Never handle any perfumed deodorant or cold cream soaps before you handle your lenses. Avoid using waterproof mascara when you are a contact lens wearer. Avoid using eyelash lengtheners or thickeners because the fiber in them can irritate your lenses.